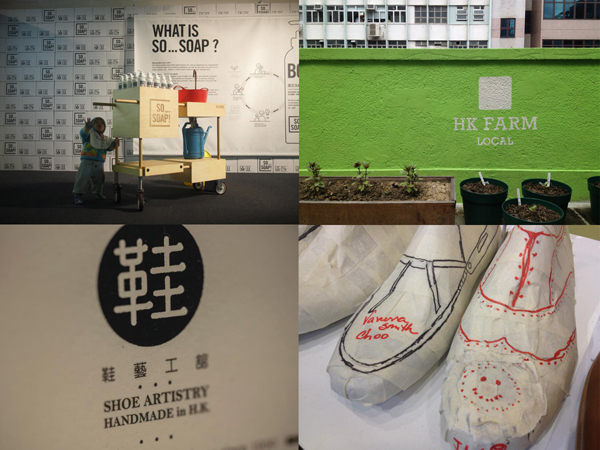 As Hong Kong is about to open the 2012 edition of its Business of Design Week (BODW), culture360.org takes a closer look at the local design scene, including its most forward-thinking players who are pushing design beyond mere business practices and giving it many other facets. In the city otherwise known as the Pearl of the Orient and which is often perceived as a crossroad not only between East and West but now increasingly between East and East, many initiatives are taking place in parallel to China’s rising influence in the world. “In the context of Hong Kong, every ‘present’ is fading then vanishes without notice. What has existed will keep bring erased. Perhaps we are making a monument for the city: a monument for the consumed future and the fading present.” – Gary Chang, Founder, EDGE Design Institute Ltd.
Hong Kong, the fast-paced metropolis, always seeking change and the new, chasing the glitz and glamour, may still be around, yet today, this stereotypical image of the city is counter-balanced by a growing number of creative practitioners who place culture and social value at the heart of their endeavours. It is interesting to observe how the local design industry is diversifying to lean closer to sustainable practices, perhaps in response to the overpowering notion of economic growth that is associated with the region. Design is business, but design in Hong Kong is also about shaping society and building upon meaningful layers of cultural legacy. “I am interested in working for ‘non design industries’ like agriculture, working with people who know nothing about design, and working with local craftsman. I am more interested in collaborating with new industries as opposed to designing something new. By working with a beekeeper or a furniture maker or someone who makes Chinese name chops, inevitably you’ll have something new working with this different industry but you come out with something even more fresh and creative and cultural. It’s these types of new cultural products that I’m more interested in” – Michael Leung, of Studio Leung and HK Honey. Is it the pressure induced by an acceleration of time or the uncanny patterns of global consumption that push an emerging type of local designers to work at the intersecting boundaries of design, social development, and cultural preservation? One of the most talked-about Hong Kong design firms these days is CoDESIGN Ltd., co-founded by Eddy Yu and Hung Lam in 2003. One of their initiatives CoLAB connects young designers with social enterprises and NGO’s to generate new products that carry the design appeal that is often missing from this type of work. “We need to work hard to prove that design can not only enhance commercial value, but make society better. Design is absolutely not about cartoons, packaging, and trendy gadgets (…) Designers should consider themselves as problem solvers (…) I can see that environmental and social problems will become the most inspiring muse for designers.” – Hung Lam, Co-founder, CoDESIGN Ltd. The investment here is not financial but of wider importance. It is about sustaining local communities and environments for the city’s long-term future, intervening on a small scale to impact a large scale framework. 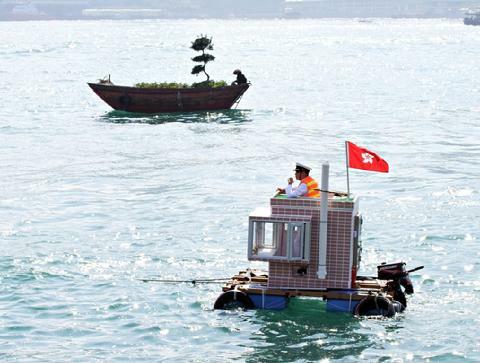 “Paddling Home is a 4x4 feet house floating on the sea. This tiny building resembles a typical residential apartment block completed with features such as bay windows, air conditioning unit, and stainless steel gate. Like a paddling boat, two paddling oars can be pushed out from the two walls, allowing the house to be slowly paddled away. The concept came from the extremely expensive living conditions in Hong Kong, where people can only afford a tiny apartment and have to spend a lifetime repaying their mortgage.” – Kacey Wong. The lack of space and the urban topography, which Hong Kong is notorious for, are subjects for local urban design think-tanks such as STAG that concentrates on the complexities linked to the idea of global city and local territory. 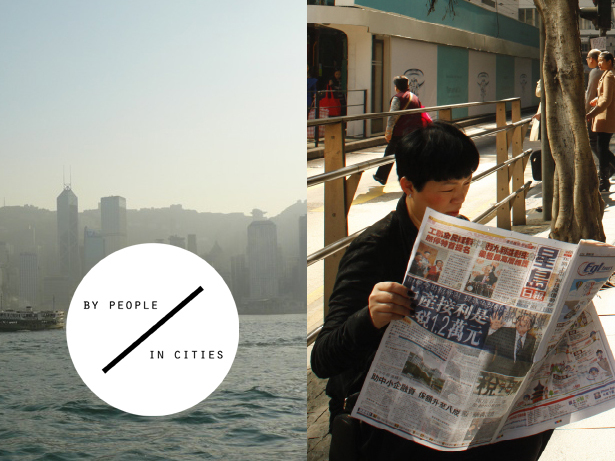 Their papers and photo-essays showcase the challenges that exist in a city in constant transition, and where people have learnt to adapt to their mutating environment. “HK, like a living organic structure, replaces its un-adapted or disabled cells for supposedly more adapted or more competitive ones. This kind of mutation (…) changes the image of the city but never its identity. HK is by definition a place of transition” – ‘Mapping Hong Kong’ STAG. Perhaps the very nature of Hong Kong, as a place of transition, makes it very appropriate for the design industry that seeks to explore new territories and can use the city as an experimental canvas. Chinese architect Ma Yan Song of MAD Architects believes that Hong Kong has many office buildings but needs more cultural projects as features. He is particularly concerned about the importance of relevant content. “A good project doesn’t mean we need to build many theatres and arenas. We have to focus on originality.” – Ma Yan Song, MAD Architects. The West Kowloon Cultural District (WKCD) is undeniably one of the most ambitious cultural development projects in Asia, not only because of its scale but also because it aims at integrating a local cultural perspective within a global context. While WKCD’s M+ museum building is scheduled for completion in 2017, preliminary activities are organised through two satellite units called Mobile M+ (exhibitions) and M+ Matters (public events). 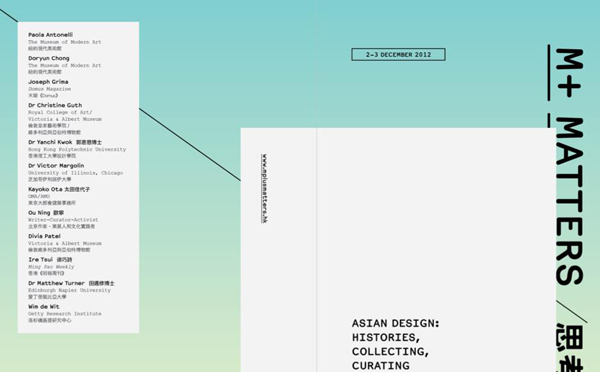 One of the events, and part of BODW 2012 programme schedule, is a panel discussion on Asian design entitled Asian Design: Histories, Collecting, Curating. M+ will be the first museum of its kind to collect and curate ‘Asian design’ or ‘design in and from Asia’. As such, it will play an experimental role in shaping the local and global definition of design, an industry which has, for the longest time, been shaped by modernity, but is now looking more closely at traditional cultural values. Throughout its history, Hong Kong has had the privilege of seeing the world through different vantage points. The multiple perspectives and experiences have shaped Hong Kong into a true modern city with, at its core, a strong identity and culture. Designers will play an increasingly important role towards Hong Kong's future as their task is to carry both the traditional and the modern forward, in a place defined by the beauty of its own contradictions. “Yuen Yeung takes its name from a common Hong Kong drink, which mixes tea and coffee to create something which is eccentric and unique. Yuen Yeung aims to create a conceptual mix between old and new, refined and raw, pragmatic and emotional, just like the famous Hong Kong drink. Each object is a particular combination of two very different things and brings an authentic taste to the local design scene.” – Mission statement from Yuen Yeung, product design firm based in HK. 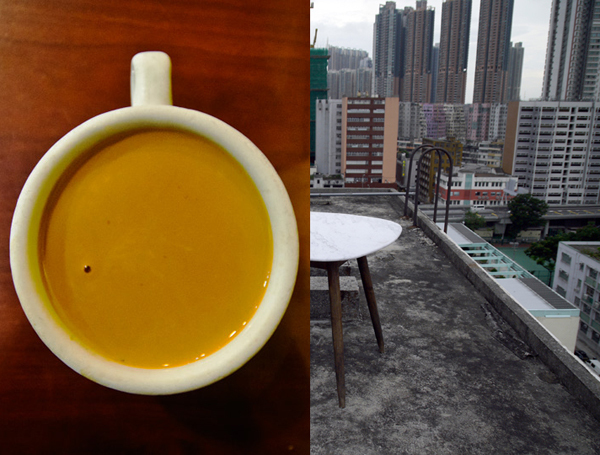 Sources: 360° , CoDESIGN Ltd., Dt Communication, EDGE Design Institute Ltd., Kacey Wong, STAG, Time Out HK, Yuen Yeung. 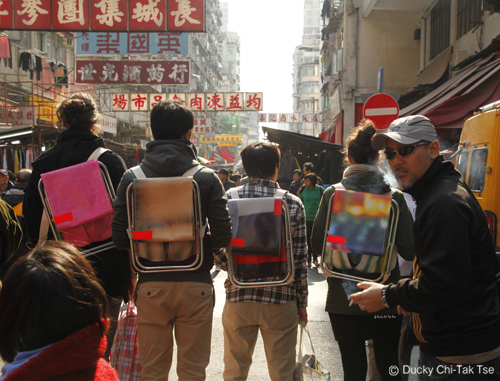 Photo credits: Sali Sasaki, Ducky Chi-Tek Tse, HK Honey, CoDESIGN Ltd., Kacey Wong, STAG, Yuen Yeung.